Summary : This tea from the Dragonwater Tea Company (now out of business) is a wonderful Oolong Tea. If you love jasmine...well, what is there to say...this tea is for YOU. Review : I was really in the mood for a tea tonight with a "big kick" to it. Really big! Why...I have no earthly idea. But does it matter? No! I just wanted a tea that really packed a flavor and aromatic punch. My first thought was chocolate! But I couldn't find any chocolate teas I've tried before among the 100+ samplers I haven't tried yet. Besides, there isn't too many chocolate teas I've actually liked. And so, getting desperate, I modified my thinking. And then...happily...came across a neglected Jasmine Tea. Did we say Jasmine! Flowers! Big Taste! Huge Aroma! My lucky day! And so, in a happy frame of mind, I gave a Jasmine Oolong Tea from the Dragonwater Tea Company (now out of business) a try. Here is the description of this tea as provided by the Dragonwater Tea Company (now out of business) : "Jasmine Oolong Tea. 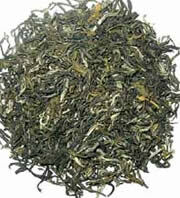 Sweet tasting Oolong tea delicately scented by jasmine blossoms. The tea is plucked and produced during the spring, but not scented with Jasmine until summer resulting in a fresh and sweet cup." The aroma of this tea right out of the bag did NOTHING to disappoint me...unlike that unsatisfying Jasmine Rooibos tea I tried. And that is a good thing. You see...Jasmine Teas should stink up the whole house! A good jasmine tea will have a killer aroma to it....and it should be the aroma of flowers too! And so I began the brewing process. Even better! The minute I added water the tea truly came alive...as the aroma of the jasmine was released. And so with these happy thoughts I let the tea brew it's assigned three minutes. And thankfully...the flavor of this matched it's delightful aroma. Now...it is NOT the strongest of jasmine teas on the planet, but it's no slocuh either. This tea really packs quite the jasmine flavor to it. And, perhaps best of all, the "straight oolong" flavor I was very worried about was for purposes non-existent. As such, this tea essentially was a pure jasmine tea with no other flavors really present. While the flavor of the jasmine in this tea wasn't nearly as strong as found in the Jasmine Green Tea I fell in love with...believe me when I say this...it is still quite strong. If you love jasmine teas, I think you will truly like this tea. And since the sometimes overpowering flavor of "straight oolong" is happily missing in action...what you get in this tea is a very, very "straight up" version of a jasmine tea. Overall...if you love jasmine teas...then this tea has your name on it. If you don't like jasmine teas...well, this tea will not be for you! Recommendation : Absolutely. This is a superb jasmine tea, with a "oolong base." Make no mistake...this tea is all jasmine. You'll be hard pressed to even find the traditional flavor of oolong in this tea. And for a jasmine tea...that is a very good thing indeed! Brewing Instructions : Use 1 teaspoon of leaves. Pour 6-7 ounces of water heated to boiling. Let brew for 2-3 minutes.